Happy New Year! Forgive me, I'm a few days late with my salutations, but I wanted to be sure to greet you properly as we are getting settled into 2018. I can't believe another year has come and gone so quickly. It seems as if time increasingly picks up the pace the older I become. Then I figured out the secret, we had kids. Until I became a parent, never had I witnessed such a large measure of time pass with such speed. With time being such a precious commodity, and my lack of ability to control it, I believe that there is no time better than the present to firmly set my heart and hands to spending it wisely. I've unintentionally taken a break from joining the weekly five minute Friday linkups. Birthday, holidays, and plot twists (my new term for life's interruptions or unexpected changes), challenenged my schedule to the max. However, I am glad to be back to sharing a moment with you here and with the FMF community. If you are interested in what the linkup and community is all about, you can find more information here. The writing prompt for this week is Intentional. 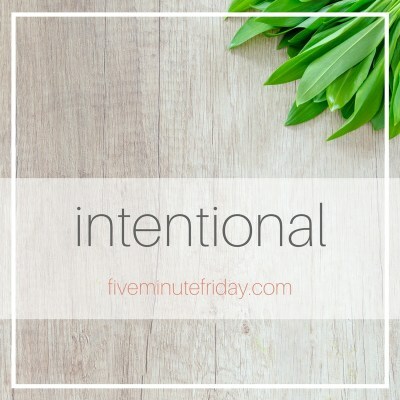 And when I think of being intentional, time is probably the most important component of intentional living. I'm going to be completely trasnparent with you here. I have a time management situation. Because I know (and now accept) this about myself, it is critical that I use various methods and resources to assist me on my journey. These are by no means new tricks, but they have proven to be helpful when I consistently implement them. Hope you can find a takeaway that will bless you on your journey also. I sit down at the table and write out my stuff. All of it. Brain dump, lists, planner, scratch paper (as my mom used to call it) anything I can get my hands on to get the information from my head to paper. I fill in the blanks. I go back through my smartphone calendar, text messages, social media messages and fill things in at appropriate time slots so that I can actually see where I have (or don't have) chunks of time. I edit. This is undoubedtly the most effective of my stratgies. Part of being and living intentionally is to block out time. Time for Jesus, time for family, and especially time for yourself. I don't always do well at this, but I'm realizing that my life feels like it has more room and space when I get this right. What I desire most from being intentional is being able to use the time I find to bless others. Whether it be through a blog post, phone call/text, outing, or social media interaction, I realize that those things can't happen unless I am more cognizant of my time.